So what is the difference between precious and semi precious? Nothing but semantics in reality. There is no reason an ugly low quality ruby should be considered precious and beautiful Tsavorite is not precious. Precious gems have been marketed as “precious” in order to fuel sales in certain areas of the market. The first thing I learned about gemstones is that rarity,colour, size and beauty make up the price, not marketing. "precious gems" like ruby and sapphire can be found in very low quality and very inexpensive whereas "semi precious gems" like Tsavorite, Aquamarine, Spessartite, Spinel, Paraiba Tourmaline etc can be found in extremely high quality, are phenomenally rare, and be very very expensive!!!. The definition of precious and semi precious is therefore ambiguous, sometimes a misnomer and misleading. When purchasing stones the Beauty and rarity is the most important factor. This rare gemstone is named after the Russian tsar Alexander II (1818-1881). Alexandrite displays a color change (alexandrite effect) dependent upon the nature of ambient lighting. Some display vivid Green in Daylight and vivid red in Incandescent light. Diamond are pure Carbon produced under enormous pressures and temperature. A diamond (from the ancient Greek ἀδάμας – adámas, meaning "unbreakable," "proper," or "unalterable") is one of the best-known and most sought-after gemstones. Diamonds have been known to mankind and used as decorative items since ancient times; some of the earliest references can be traced to India.The hardness of diamond and its high dispersion of light – giving the diamond its characteristic "fire" – make it useful for industrial applications and desirable as jewelry. 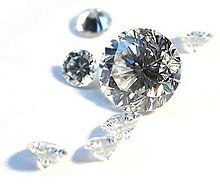 Diamonds are such a highly traded commodity that multiple organizations have been created for grading and certifying them based on the four Cs, which are color, cut, clarity, and carat. Other characteristics, such as presence or lack of fluorescence, also affect the desirability and thus the value of a diamond used for jewelry. of other colors: Pink, Golden, Green, peachy Orange, Purple and Colorless.Sapphire and Ruby comprise more than half of all Gemstones sold worldwide. Sapphire's popularity is not based on color alone. Its hardness of 9 places it next to Diamond (10), making it an excellent choice for jewelry worn daily. It is frequently featured in engagement rings. Most people relate Sapphire to the color Blue. The first documented Emeralds were mined in the deserts of Egypt near the Red Sea in what were known as Cleopatra's Mines. Egyptian Emerald mined today are small and dark stones. Sources for this gemstone are Colombia, Africa, and Brazil. The name for Emerald is taken from the Greek smaragdos, meaning Green stone. Chromium, vanadium, and iron are the trace elements that give emerald its color. Emerald Treatments - Virtually all Emerald on the market has some sort of surface-reaching fractures and openings. The visibility of the inclusions is reduced by filling them. Traditionally, oils (such as cedarwood oil) are used but in time they tend to dry out thus making the inclusion more readily visible again and the gem would require another oil bath. Today, natural resin or wax type materials are preferred over the traditional oils, since the resin or wax is a natural substance with more of an almost permanent treatment life. Emerald enhancement processes date back over 600 years, and oil, natural resin, or wax type treatments are accepted trade practices that do not adversely affect the performance and durability of the gemstone, so you can expect all Emeralds will have some type of enhancement. There's no need to worry when you see these enhancements disclosed. CARE - Emeralds must be treated with care to prevent chipping. Emerald jewelry should not be cleaned in an ultrasonic or steam cleaner. I recommend Ionic Cleaners and/or warm, soapy water and a soft brush as the best way to clean Emerald jewelry. Beautiful Rubies are, and for a long time have been, collectors items and investments. Ruby is of the mineral species Corundum (ko-RUN-dum). The red color Corundum is Ruby, all other colors are Sapphire. Some gem dealers debate the borderline between Ruby and Pink Sapphire. Origins:Rubies have historically been mined in Thailand, the Pailin and Samlout District of Cambodia, Burma, India, Afghanistan, Australia, Namibia, Colombia, Japan, Scotland, Brazil and in Pakistan. In Sri Lanka, lighter shades of rubies (often "pink sapphires") are more commonly found. After the Second World War ruby deposits were found in Tanzania, Madagascar, Vietnam, Nepal, Tajikistan, and Pakistan. Current large deposits have also been discovered in Mozambique and Madagascar. TREATMENTS - Over 99% of all Ruby on the market is heat treated, to stabilize and/or enhance the color and/or clarity. The typical heat treatment process is a permanent process that does not adversely affect the performance and durability of the gemstone, so there's no need to worry when you see this enhancement disclosed. Buying gemstone out of the back of a car in Sri Lanka, some nice stones. Powered by Store Theme. © 2015 Coloured Gems. All Rights Reserved.